Let the faith that you have in our Lord Jesus Christ shine with this exquisite diamond solitaire cross necklace made in .925 sterling silver. "And how shall they preach, except they be sent? as it is written, How beautiful are the feet of them that preach the gospel of peace, and bring glad tidings of good things!" (Romans 10:15). We are commanded to preach the Gospel to the lost and proclaim our faith to the ends of the earth. Let this diamond cross necklace be a conversation starter among your friends and family and those you meet. Necklace is 18" in length and cross measures 16.5mm x 13mm in size (0.65 inches x 0.51 inches). Diamond is 0.015 carats. Apples of Gold Jewelry is committed to bringing you Christian fine jewelry at an affordable price, while proclaiming the Word of God. All of our Christian cross jewelry comes with free shipping and our 45-day return policy. 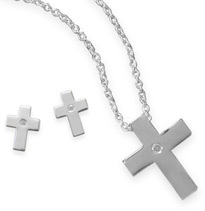 Also available with matching diamond cross stud earrings or purchase them both as a matching set (shown below). 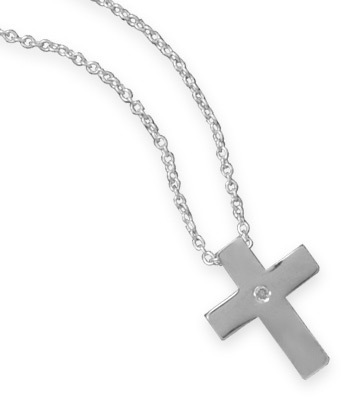 We guarantee our "Let Your Faith Shine" Solitaire Diamond Cross Necklace, Sterling Silver to be high quality, authentic jewelry, as described above.